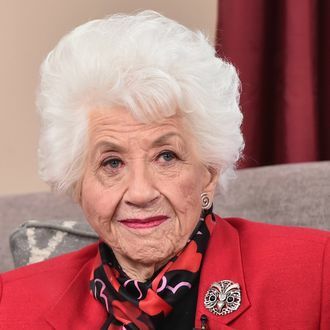 Actress Charlotte Rae, born Charlotte Rae Lubotsky, died Sunday at the age of 92, her representatives confirm. While no cause of death was immediately available, in 2017 Rae had discussed being diagnosed with bone and pancreatic cancer. After appearing on shows like Car 54, Where Are You?, Sesame Street and The Love Boat throughout the ‘60s and ‘70s, Rae’s Diff’rent Strokes housekeeper Edna Garrett proved so popular, she garnered her own spinoff The Facts of Life, which Rae starred in as the devoted housemother of a girls’ boarding-school dorm from 1979 to 1986. After leaving Facts in 1986, replaced by Cloris Leachman for the last two years of the show’s run, Rae took a variety of voice and acting roles on shows ranging from the animated 101 Damations: The Series to ER to Girl Meets World. In 2015, Rae co-starred in Jonathan Demme’s Ricki and the Flash and published a memoir entitled (what else?) The Facts of My Life, co-written with one of her two sons Larry Strauss. A Facts of Life Reboot Is Coming From … Leonardo DiCaprio and Jessica Biel?